Shores at Waikoloa 317. Beatiful 1 Bedroom Condo. Newly Remodeled. STEP INTO PARADISE IN THIS TOP FLOOR 1 BEDROOM UNIT REMODELED TOP TO BOTTOM! This unit is all about the incredible views from every window in the unit. You can see Mauna Kea, Mauna Loa, Hualalai, and the Kohala mountain ranges from every window in the unit. After 9:30 am there is nothing but amazing cool shade on the lanai and a BBQ grilling area fifty yards away from the unit. This special unit is located right behind the swimming pool and is as peaceful as it gets. There is a dedicated parking space for 1 car with this unit and plenty of visitor parking across from the unit. This remodeled one bedroom, 1 ½ bath unit is quite spacious and features a brand new 55" flat screen television with cable in the living area. It is quiet and private on the top floor and is only steps to the swimming pool and BBQ grill area. The open kitchen features new corian countertops and seating at the countertop bar. The private master suite has a private bathroom and a beautiful king bed. The master suite offers a 42 inch TV with cable and a private desk area and free wifi if you must work while in Hawaii. There is also a queen sofa bed and a twin sofa sleeper for use in the living area if you have guests. This unit also offers a tankless water heater for a never ending supply of hot water at all times. This unit also includes; basic cookware, dishware, drinkware, regular coffee maker, blender, rice cooker, washer/dryer, hairdryer, bed and bath linens, iron, air-conditioning, wireless internet service. There is plenty of beach gear; 2 beach chairs, 2 boogie boards, cooler and umbrella as well as beach towels for your use. All our vacation rentals include a basic “start-up supply” of: laundry detergent, garbage bags, kitchen sponge, liquid soap, dishwasher tabs, paper towels, toilet paper, shampoo, small bar soap and salt/pepper. Cooking oils are not provided. Once the startup supply runs out, guests are on their own to purchase additional supplies if needed. Cleaning solvents are not supplied. 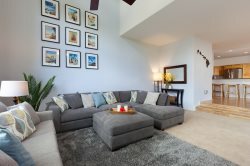 The unit is at a premier location; The Shores is a gated community, which has it’s own Jacuzzi spa, fitness center and tennis courts with a swimming pool and BBQ grills. It is within the world renowned destination Waikoloa Beach Resort with lovely A-Bay Beach, the Kings and Queens shopping centers, many good restaurants and the Marriott and Hilton Waikoloa Beach Resorts. The central location on the South Kohala Coast features an average of 350 days of sunshine a year and temperatures in the 70s and 80s, only varying an average of 5 degrees from summer to winter. Waikoloa Beach Resort has everything you need for water sports - snorkeling, dive boats, whale watch boats, equipment rental stores and more. The island’s best beaches are close by with A-Bay a 5 minute drive and many world-class beaches a short drive from the resort, including Hapuna State Beach. The beautiful, warm ocean waters feature turtles, dolphins and whales (December-March). Water adventures from snorkeling, diving, paddle boarding, fishing and sailing/whale watching/snorkeling cruises are available from the resort. We have many world-class golf courses: 2 within the complex and 7 more within a short drive-a golfer’s paradise! You will be at a central point to explore the fantastic Big Island with adventures in every direction from the Volcano National Park to Waipio Valley.